The main relay of an automobile is undoubtedly one of the most important and main components of a car. It controls computer and the whole fuel system of your car. The moment you turn over your key before even cranking the engine, this relay is what becomes operational, and without it, your car’s computer won’t get power, your car’s fuel system will be not power up and as a result, your car won’t start. So it is safe to say that, without the main relay, your car won’t be going anywhere. Main relays are designed to last for as long as a car’s life but being an electromagnetic component, it can fail at some point. What is a Main Relay? Similarly, if a car refuses to start, it is unlikely for the main relay to go bad but it’s not impossible. To pinpoint the exact problem, professional help is required as complex electrical systems can only be checked by certified mechanics with electrical knowledge and experience because a slight mistake could render any of the main electrical parts of a car useless so extra precaution is absolutely necessary. As mentioned above, the main relay controls the fuel system. If the relay is faulty, it will not provide the power with the fuel system needs, and if the car gets no fuel, the car will not start. Although there can be countless other factors, much more common, preventing the engine from starting, there can be times when the main relay proves to be the problem. Unfortunately, this isn’t an easy diagnostics and could take time to come to the relay. It’s better to consult a mechanic for the job. Check engine lights can make diagnostics a whole lot easier with an OBD/OBD-II scanner depending on the manufacture year of the car. The code thrown by the car’s computer can sometimes accurately pinpoint the cause of the issue and can make the problem known to even owners easier. If you have a scanner and know how to use it, you can check for the code. If the car struggles to stay running and dies shortly after starting, the main relay can be blamed as it provides the power to the fuel system and the car’s computer which constantly checks and balances the fuel/air intake and the proportion of mix which ensures smooth running of the engine. If your car does that, it could indicate that the relay sometimes works temporarily and other times fail. This will require you to address the issue as soon as possible as it could have to stranded someplace with no mechanics nearby so it’s better to see a mechanic if you notice this symptom. If you notice this, this is caused by the heat dislocating the solder joints on the relay and ruining the circuit path. This is a recurring problem which will need to be addressed immediately as it can further damage the main relay if not checked in time. There are a few things you can do to surface diagnose the main relay which doesn’t require technical knowledge. Doing so will help you determine whether your car’s main relay is going bad or completely dead. Diagnosing a bad main relay can be difficult since a lot of factors need to be taken into account when the problem of the car not starting arises. From fuel to air to the fuel pump and spark plugs, any of these things can disrupt the normal working of a car. If you are familiar with basic car knowledge, you can self-diagnose your car to a point until you find the issue. As you turn the key over in 3 steps, the main relay clicks 3 times on different key positions. To check if the relay is working on all stages of the key, place your hand on the relay and turn the key over one step. You should hear a click. This will only unlock the ignition. Turning the key further should turn on the electrical systems. The relay should give another click at this stage. Finally, the last stage starts the car at which too, the relay should give a click. If at any point the relay fails to click, there could be a problem there. Sometimes tapping the relay makes it work temporarily. If tapping the main relay does have the car startup, the main relay is going bad which needs to be repaired or replaced. 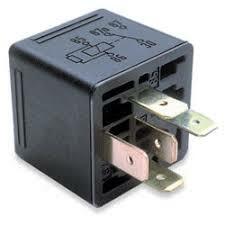 Replacing the relay isn’t much difficult but repairing it will require electrical expertise. If you are unable to get your get running after checking all the basic things to check, it is likely that the main relay is bad or there’s an electrical problem which might have fried the main relay. The average cost to replace the main relay can go above $200 depending on the vehicle model and make. To save the cost, you can perform the replacement procedure at home as well.